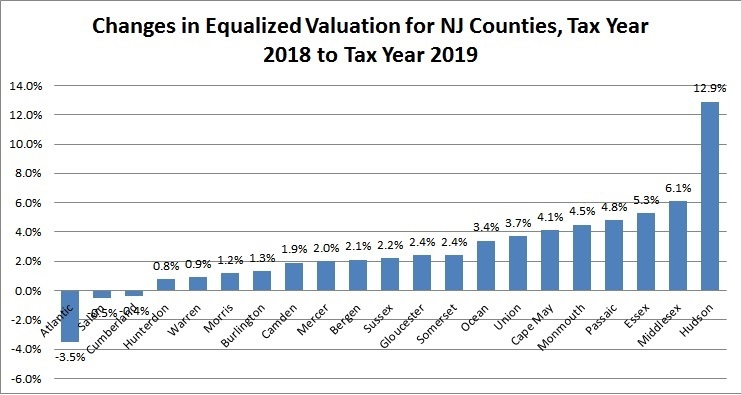 The NJ Department of Treasury has just released the Equalized Valuation of every town in New Jersey for FY2019 and thus given us an insight into shifts in state aid for 2018-19 and New Jersey economic trends. Equalized Valuation is the market value of all the (taxable) property in a town. It is updated every year by the county tax assessor and is used to apportion county taxes and, theoretically, school aid. So, if a district had an Adequacy Budget of $80 million and a Local Fair Share of $60 million, it would receive $20 million in Equalization Aid, since $80 million - $60 million = $20 million. If a district's Local Fair Share exceeds its Adequacy Budget, it does not receive Equalization Aid. 45% of NJ districts are not supposed to receive Equalization Aid in 2018-19. Jersey City has the largest Equalized Valuation in New Jersey, so I will use it as a concrete example. For underaided districts, the increase in Equalized Valuation does not have an impact, since it only changes the money they are theoretically due. Newark's $1.2 billion gain in Equalized Valuation will translate into an $8.5 million loss in Equalization Aid. Since Newark is underaided by $130 million anyway, the loss in Equalization Aid is theoretical. Theoretical Equalization Aid Changes for Twelve Largest Districts in NJ Based on Changes in Equalized Valuation. The State's total Equalized Valuation grew from $1,242,801,663,665 to $1,288,305,163,962, a one year net increase of $45 billion, or 3.7%, which actually exceeds inflation. However, the median town's gain was only 2.2%, since large portions of the state's total gain are concentrated in a few cities, with Jersey City gaining $5.6 billion and Newark gaining $1.2 billion. 6. Jersey City's PILOTed property, estimate at $12-$13 billion. The most important story of changes in Equalized Valuation is Jersey City's growth. 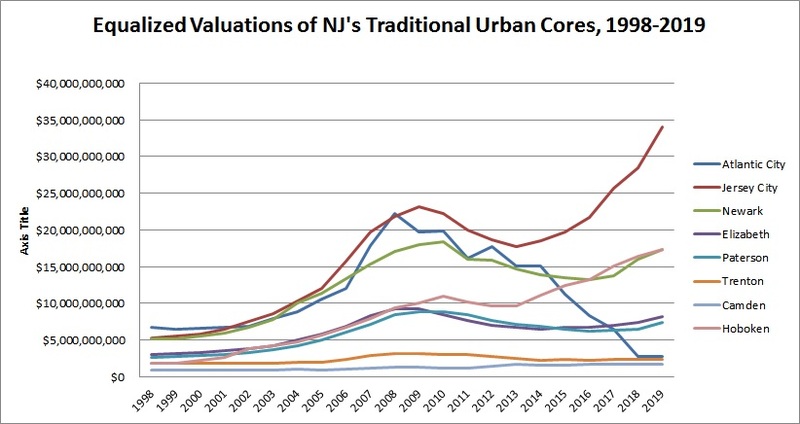 Jersey City has grown from having barely 1% of NJ's total Equalized Valuation in the 1990s to having 2.81% of NJ's total Equalized Valuation in tax year 2019. I maintain my projection that Jersey City will no longer qualify for Equalization Aid in 6-7 years. Two Cheers for County Taxes! How is Equalized Valuation determined? Equalized Valuation is determined by calculating the ratio of sales prices to a town's official assessment for its own local taxes. If sale prices are, on average, 110% of properties's official assessments, then Equalized Valuation would equal 110% of a town's total official assessment. If sale prices are 93% of official assessment, then Equalized Valuation would equal 93% of a town's total official assessment. Because Equalized Valuation based on a ratio of sale prices to official assessment, a town's refusal to do a reval does not affect Equalized Valuation. Contrary to assertions from Sen. Mike Doherty and the Toms River Board of Education, Jersey City's decades-long refusal to do a reval did not distort its state aid since JC's Equalized Valuation constantly grew along with its real estate market. Jersey City's state aid was distorted by Adjustment Aid and PILOTing, not the lack of a reval. If a town's Local Fair Share exceeds its Adequacy Budget, a change in Equalized Valuation has no theoretical impact on state aid at all, since it doesn't matter if a Local Fair Share exceeds Adequacy Budget by 5% or 150%. Equalization Aid is $0 in either case. Note: Equalized Valuation is not the same thing as the aggregate assessed value, which is the sum of all the individual assessments on properties and will not reflect real market value if the reval was not done recently. Assessed values are only used for a town's internal tax apportionment. Great post and thank you for this. How is the district income computed? I know that the source of a district's Aggregate Income is the Department of Treasury and I know they use lagging data from two years prior to the current year, although I don't know the details of how the Department of the Treasury tabulates Aggregate Income. They must have a method of removing income outliers too, although I don't know that for a fact. Fortune Magazine: "The public pension bomb"
Philadelphia Inquirer: "Since 1992, governors have been shortchanging N.J. pension fund"
WSJ: "NJ's Pension Woes Spur Blame Game"